This Opuntia has the growth characteristics of most of the genus, but tends to grow more upright than many of them. In habitat or open ground it can achieve a height of 3ft. and a spread of 6ft. The cladodes (pads) are usually slightly longer (usually up to 4in. 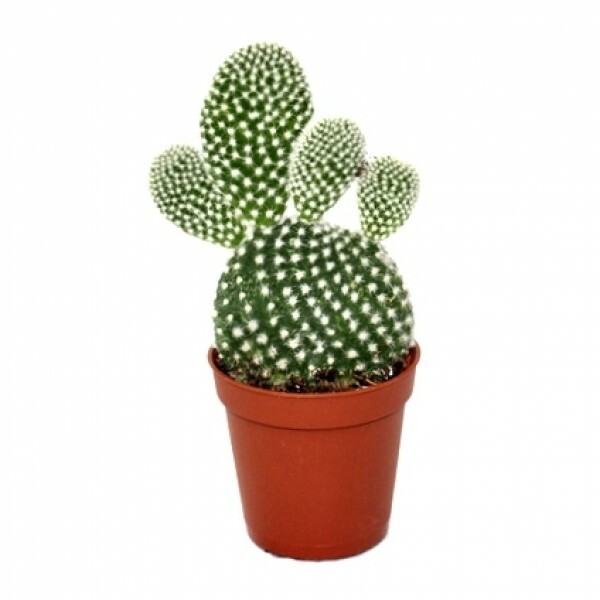 [10cm]) than they are wide and they are spineless, but don’t be fooled by this, they have tufts of thousands of barbed glochids which can attach themselves to the unwary at the slightest touch and are annoying and irritating, rather than painful. There are a number of varieties, rufida has reddish glochids, albata has white and is perhaps the smallest variety usually only growing to 18in tall. It is also the one that is most likely to flower when pot grown. There is also a monstrose variety. The plant can be grown from seed, but in practical terms is almost always propagated from cuttings of the pads (which should be at least one year old). Light: This plant will take all the sun you can give it, but will also grow well in light shade. Compost: Your normal compost mix will suit this plant fine. If you are known to be heavy handed with the watering can, mix in a little more grit. Water: Once the plant is established in open ground it does not need a great deal of water. If it is kept in a pot, water slightly less than normal. Nevertheless give it a good soak and then allow to dry completely before watering again. Do not water little and often which is a recipe for disaster. Flower: The flower can vary from yellow towards orange and is not often seen on plants in pots, but they do appear in profusion on plants in open ground. The fruit is round and reddish in colour.